Brugmansia candida grows as a large shrub or small tree. The Trumpet Tree blooms are incredible for the size of the blooms, prominence and fragrance. Legend has it that by sleeping under Trumpet trees strange dreams come to you. 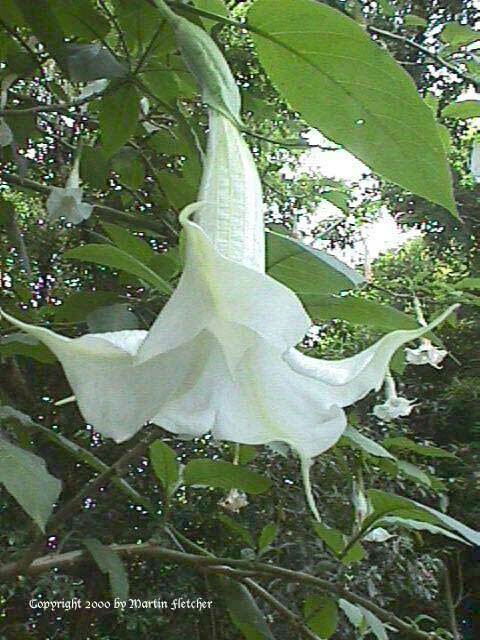 Brugmansia and Datura might be intoxicating but they are also extremely poisonous and should not be ingested or planted where children are likely to play or pets might browse. Flowers and foliage of Brugmansia candida the White Trumpet Tree.